Miss Erica cracks me up. After buying the gorgeous Bulova watch the other day, she decided to get a gold version of it, and I have to say it is totally gorgeous. And it feels somewhat good not to be the only one who spends the big bucks here. Eh eh! Here is Erica's blurb. Enjoy! "I already have the stainless steel, diamond-encrusted Bulova watch and love it! But at times I often find myself wishing I had it in gold too, because there are so many colors and outfits I wear (especially when I dress up and go out) that gold would enhance so much better than silver ever could. And, let's face it, gold is hot and never goes out of style. 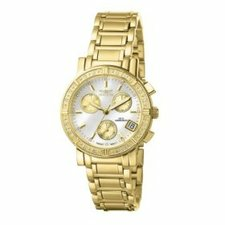 So I started searching online, and I found the Invicta Women's II Collection Limited Edition Diamond Watch on Amazon.com. I seriously felt like I hit the jackpot! It reminded me a lot of my beloved Bulova, without being an exact match. It has a similar swiss chronograph feature and a genuine diamond bezel, however, this timepiece is even more beautiful with its three gold-tone subdials and its iridescent mother-of pearl face. I didn't even have to think twice about ordering it (free shipping and great return policy), and when I received it in the mail, I couldn't have been more pleased since it looks better in real life than it does online. And that's not all! This watch was marked down to 195 dollars from its retail value of nearly 700 bucks! So If you need dazzling gold timepiece (and can't afford a Rolex quite yet), I definitely recommend this stunner!"